Please, validate the Google capcha to activate the shell on the right. Then, you can either copy the commands yourself, or simply click on the grey boxes to automatically copy commands into the terminal. In this course, we will leverage the power of Docker Swarm Mode, released with Docker 1.13, and the great features of vfarcic Docker Flow Proxy which provide an easy way to reconfigure proxy every time a new service is deployed, or when a service is scaled. It uses docker service labels to define the metadata and rules for its dynamically-configured routing rules to send traffic from the PRoxy to real applications (regardless of the host they are within a Docker Swarm Cluster). The purpose of swarm-listener is to monitore swarm services (add, remove, scale..) and to send requests to the proxy whenever a service is created or destroyed. It must be running on a Swarm Manager and will queries Docker API in search for newly created services. It uses docker service’s labels (com.df. *) to define the metadata and rules for dynamically configure routing rules of the Proxy. In this tutorial, we will only use a 2 node swarm cluster, but it will work exactly the same way with more nodes! Copy the join command output and paste it in the other terminal to form a 2 node swarm cluster. We gives the swarm-listener 2 API endpoint to reconfigure the Proxy through environment variables. DF_NOTIFY_* environments variables defines the url of the Proxy API for reconfiguration. The proxy container is configured to listen on port 80 and 443 for the standard HTTP traffic, and will listen privately on the internal network on port 8080 for the reconfiguration API requests. You should see that a network named proxy_public has been created with Driver overlay. Later If we want others containers to be able to be accessible through the proxy load balancer we will need to attached them to this network.
! !Note: Because we are working with Docker Swarm Mode, labels must be set at the service level in the deploy section, instead of at container level!! 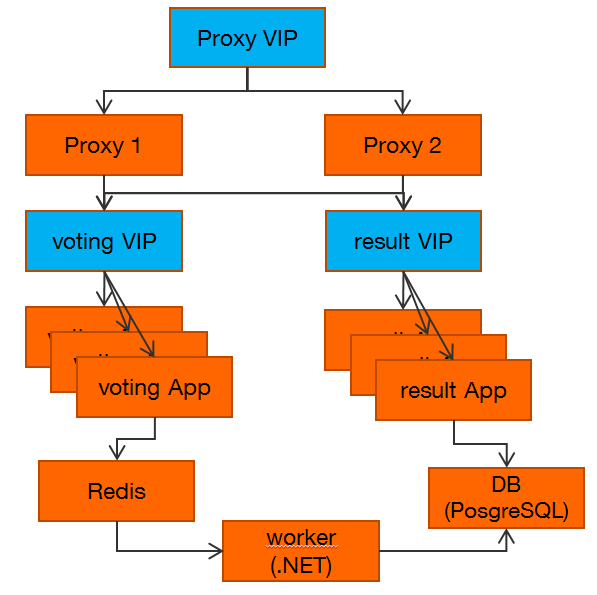 The distribute label means that reconfiguration should be applied to all Proxy instances. Swarm is continuously monitoring containers health. If one of them fails, it will redeployed to one of available nodes. If a whole node fails, or if we ask to drain all containers out of a node for maintenance, Swarm will recreate all the containers that were running on that node. In production we need to reach zero down time, and so to guarentee our nodes will be available, we need to scale our services, so that we have many instances of our service running on severals nodes. That way, while we are waiting for one instance to recuperate from a failure, others can take over the load. On every request, it’s a different docker container that will respond! We have see how we can leverage Docker labels to dynamically customize our LoadBalancing routing rules, and how docker-compose can be used to create and link services together. Now let’s try to launch a more complicated Microservice application. We will uses Docker’s vote microservice application with custom labels to be used within our Docker Flow Proxy loadbalancer. In this example, we need the incoming requests that starts with /vote/ or /result/ to be routed to the according services by the proxy. But each of our service needs traffic to be send on /, so we need the Proxy to rewrite the Path while sending the request. Current State which is the current state of the container (which may be stuck in Preparing for a moment while downloading the images). Once all containers are in the Running state, you can start test the application. You can now make your Vote!! 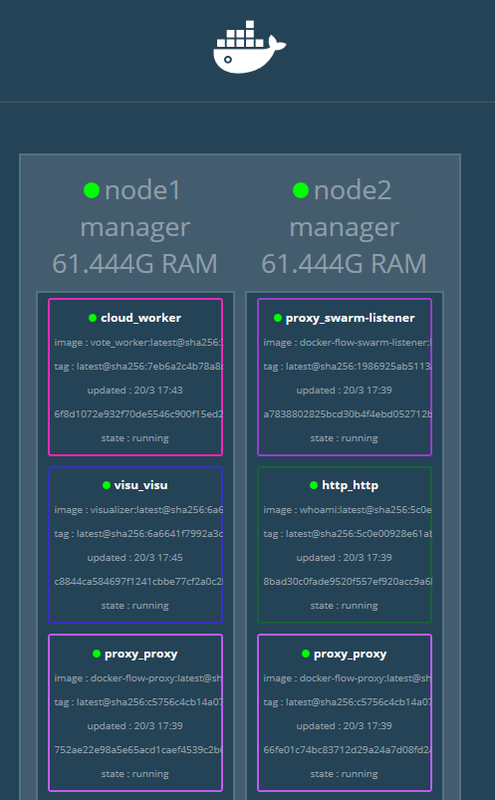 You are now able to deploy any stack on Docker Swarm Mode using docker-compose and Docker Flow Proxy!